Roger K. Strair, MD, PhD is the Chief of the Division of Blood Disorders, Hematologic Malignancies, and Bone Marrow Transplantation at the Rutgers Cancer Institute of New Jersey. He is also a Professor of Medicine at Rutgers Robert Wood Johnson Medical School. Dr. Strair graduated from Albert Einstein College of Medicine and completed his hematology/oncology internship, residency, and fellowship at Harvard Medical School, Brigham and Woman’s Hospital. 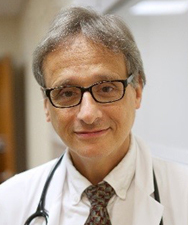 Dr. Strair held a faculty position at Yale and then joined what is now the Rutgers Cancer Institute of New Jersey in 1993 as a Founding Member. Dr. Strair is an expert in hematologic malignancies and related diseases and works closely with colleagues across all disciplines at the Cancer Institute, other national and international institutions, and in the community to develop new treatments designed to improve the care of patients with acute or chronic leukemia, lymphoma, Hodgkin’s disease, multiple myeloma, myelodysplasia, or other blood/immune-related diseases. Dr. Strair is the author or co-author of more than 55 peer-reviewed publications and works as part of a basic, translational, and clinical research team that has successfully developed a variety of new investigator-initiated treatment approaches being studied in clinical trials at the Cancer Institute. T he Potomac Center for Medical Education is accredited by the Accreditation Council for Pharmacy education as a provider of continuing pharmacy education. The maximum number of hours awarded for this Continuing Nursing Education activity is 1.4 contact hours. Designated for 0.5 contact hours of pharmacotherapy credit for Advance Practice Registered Nurses. There is no fee for this activity. To receive credit, participants must take the pre-test, view this CME/CE activity in its entirety, and then complete the post-test, with a score of 66% or better, and evaluation. The estimated time for completion of this activity is 1.25 hours. To receive their certificates, participants must demonstrate mastery of the presented material via the post-test. Participant is allowed to take the post-test multiple times.